An exterior, flexible, high-build coating designed to expand and contract, bridging hairline cracks in vertical masonry surfaces. This extremely durable, mildew and dirt resistant waterproofing paint has superior elasticity and elongation properties. A high-quality, flat acrylic latex paint with excellent hiding properties. This interior/exterior, self-priming, mildew resistant finish also provides excellent adhesion and water repellency on properly prepared interior or exterior smooth, rough and textured surfaces while achieving a natural look. It is alkali-resistant, easy to apply, last 20 years in all climatic conditions and cleans up with soap and water. BEHR Basement & Masonry Waterproofing Paint with NanoGuard<sup></sup> technology is a premium, interior/exterior waterproofer designed for porous concrete and masonry surfaces. This low odour masonry waterproofer is formulated for waterproofing above and below grade basement walls, masonry walls, retaining walls, cinder & concrete blocks, stucco and brick. This alkali resistant coating provides a long-lasting, durable and decorative finish that resists water seeping under hydrostatic pressure. It uses NanoGuard<sup></sup> technology to form an extremely strong adhesive barrier to stop water infiltration. An exterior, flexible high-build coating designed to expand and contract, bridging hairline cracks in vertical masonry surfaces. This extremely durable, mildew and dirt resistant waterproofing paint has superior elasticity and elongation properties. Marquee 946 mL Deep Base Flat Exterior Paint with Primer BEHR Marquee<sup></sup> Exterior Paint and Primer was engineered with one simple goal in mind, to keep colours you love looking great long after you paint, even under the most severe weather conditions. 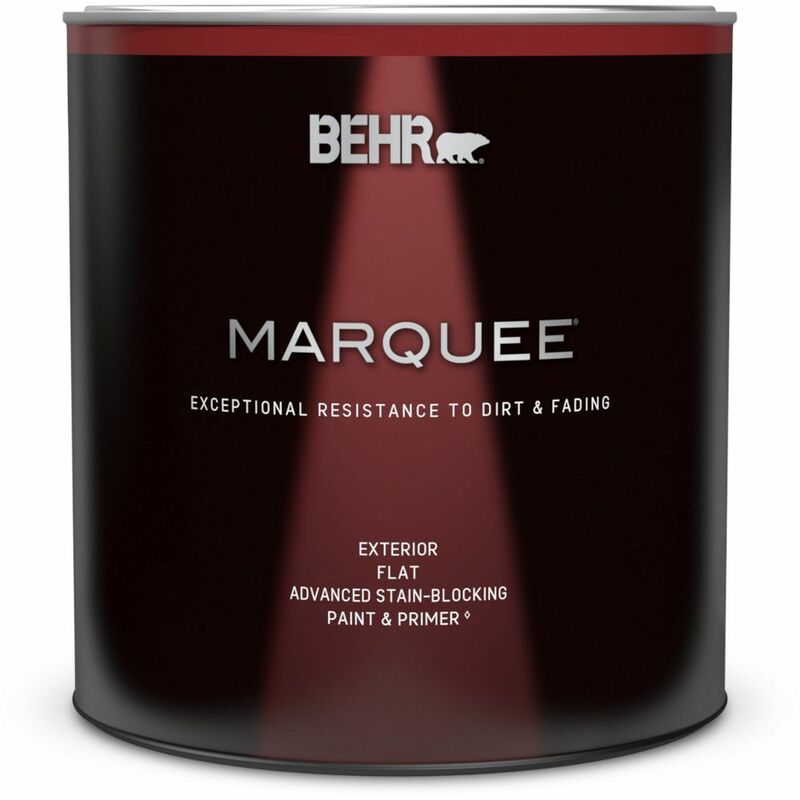 Marquee 946 mL Deep Base Flat Exterior Paint with Primer is rated 4.8 out of 5 by 108.